Jay refers, of course, to the second-ranked Carne Golf Links of Belmullet, County Mayo, which has held the No. 2 spot on the Top 50 since I wrote about it in my near best-seller, Ancestral Links: A Golf Obsession Spanning Generations. Reading between the lines, I infer that Jay found his requisite “local knowledge” in the village, possibly at McDonnells, the legendary pub on Barrack Street, just off the town square. 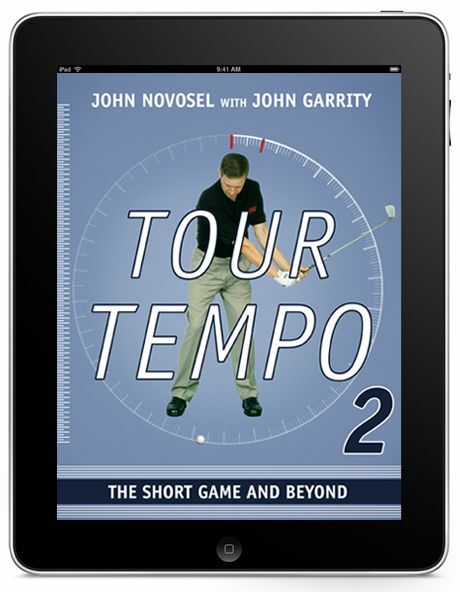 But he goes on to write about Carne’s infamous seventeenth hole, a par 4 that superficially resembles the famous Road Hole at 16th-ranked St. Andrews Old, except that it’s far scarier, much more scenic, and adds the risk of a lost golfer to the mundane possibility of lost balls. I thought you’d get a kick out of one of our bets. We had twelve guys, and each day we had four bets running — Magic 2’s, Skins, a match-play event, and a no-skill-required “Bet of the Day,” just so all levels of play had a shot at winning. The bet on the last day at Carne was how many pars there would be on #17. The handicaps ranged from the low single digits to a few at 17/18, with the balance at 10-12. Guesses on the number of pars ranged from one to five, and the winning number was just one par. But, interestingly, it only happened as a fluke. I hit my third shot to about six feet, and then another guy in our group pitched his third onto the green. His ball hit my ball and ricocheted to within an inch of the lip for the only par. What’s more, after three days, this was the only par out of the group! Thanks again John for bringing our attention to Carne. The new nine is apparently opening next week, I guess we’ll have to return. 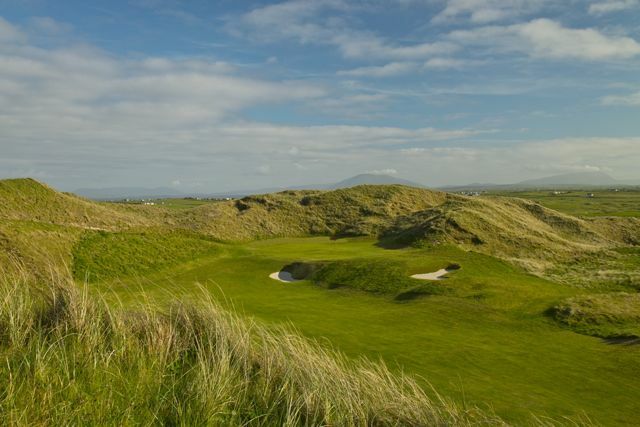 In a sure sign the Celtic Tiger may be purring again, the long-awaited third nine at Carne Golf Links in Co. Mayo, Ireland, debuts this month, marking the nation’s first significant new-build since the 2008 financial meltdown. The Kilmore nine, as it’s called, will circulate players through the largest dunes on the remote 280-acre property. The new holes, first suggested by original designer Eddie Hackett shortly before his death in 1996, were mapped out by American designer and devoted Carne fan Jim Engh in 2004. His plan was adopted in part by Irish architect Ally McIntosh, who was hired by the club to produce the final design. Like the core 18, the new holes were built on a shoestring budget, with a small local workforce overseeing the low impact construction. With its mountainous sand hills and wild, woolly challenges, Carne could host a future Irish Open if the organizers were ever stuck for a genuine links course with great Atlantic views and loads of charm and character. I migrate to Carne every summer, so I have played most of the Kilmore holes — but not with greens. Therefore my scores — impressive strings of ones and twos — do not paint a realistic picture of the completed nine. I can say without reservation that the new nine is breathtaking in every sense of the word, which is why I’m packing an oxygen bottle. Meanwhile, Audible.com has licensed the aural rights to Ancestral Links and is auditioning potential narrators. If Audible asks for my input, I’ll suggest Peter Kessler, who is fond of the book, or myself, because I lived it. Third choice: Gary Van Sickle, because he still has wet socks drying on the radiator at the Broadhaven Bay Hotel. Top 50 on TV: The Aberdeen Asset Management Scottish Open returns to fifth-ranked Castle Stuart Golf Links, and so far it has been blessed with fair weather. 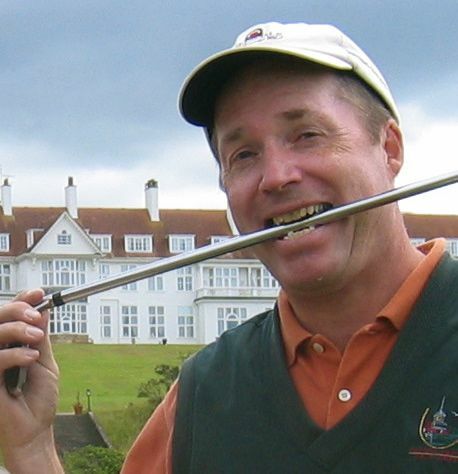 Nothing like 2011, when record rains caused a cliff to collapse onto a firth-side fairway, causing major inconvenience to players and spectators alike. According to reports, the lumps in the first fairway have been grassed over and the course continues to enchant tour players not named Graeme McDowell. I can’t believe that you didn’t take the opportunity to mention “The Shot” on the 17th, which you witnessed and wrote about in your book, Ancestral Links. I’ll refresh your memory; it was in Chapter 9. I can still see the ball flight in my mind today. Oh, has time flown, passed on too fast! I still haven’t seen a better shot than John Harrity’s on Carne’s seventeenth. Of course, I can’t see much of anything from down in the dark holes I often drive into. Written like a true golf writer!